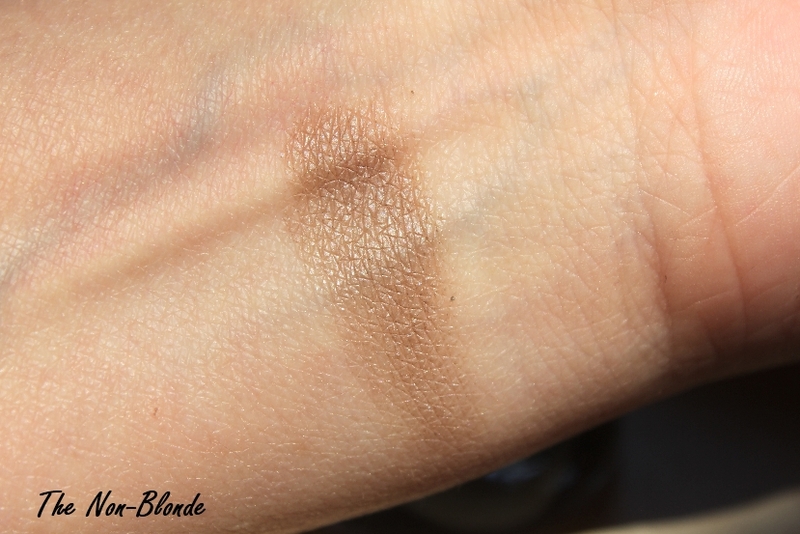 Estee Lauder Double Wear Cream Eye Shadow in Mochachino (24) is a staple. The formula of Lauder's Double Wear range is hard-working, creamy, blendable and kind to my skin. It's true to the promise of lasting from morning to night, makes an excellent base for powder eye shadow and plays well with other products. 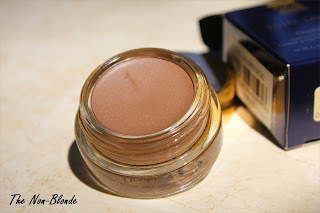 I can't get enough of creamy eye makeup (liners and shadows lately), and Estee Lauder offers some beautiful wearable options with a flattering shimmer finish. The fact that they survive NYC summer humidity is another huge advantage. 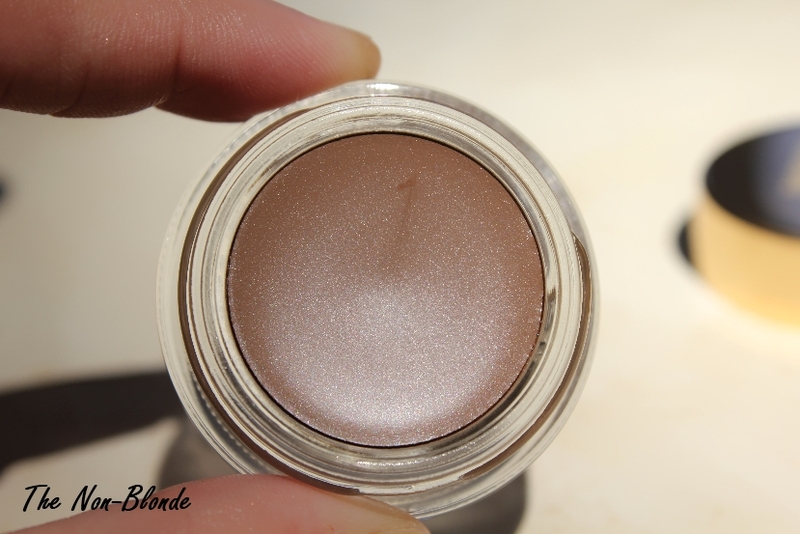 Double Wear Cream Eye Shadow in Mochachino (24) is exactly as the name implies: a medium-light brown. Lauder's Mochachino is not too warm and in certain lights looks almost taupe. It's a great partner for summer teal, my favorite navy colors and rich forest green. Those of you with fair complexions and light colored eyes can take it in the other direction and pair Mocachino with champagne and gold. While I use this cream eye shadow often and generously (and have been doing so for three months or so) I've barely made a dent in the pot, so it's not wasteful in any way. Bottom Line: a winner (and wait till you see the other shades). Estee Lauder Double Wear Cream Eye Shadow ($18.50) is available at the counters and from esteelauder.com. It's been eons since I've bought EL cosmetics, but this purchase was a recent (pleasant) surprise. This color is beautiful on it's own, or layered with sapphire blue or teal for a nice summer pop of color, or with a bronze liner for a daytime-friendly smokey eye look. And it has great staying power. Hmmm this shade looks great - I think I'm going to check it out - thanks for the review! Does anyone know how it compares to MAC paintpot in Groundwork? I have about 4 or 5 of these love them. I use the Estee Lauder eye shadow base (primer) also and have found that the pots last much longer than other brands I've purchased. However, these shadows act like a primer anyway on me. I wear them as an all over lid look, or I use them as a base to add other shadows. Murt, to me there is little difference in the two colors between this and groundwork by MAC, however on my skin I find that estee lauder's pulls a tad bit less warm than MACs. The finish between the two is different, Estee Lauder's is slight shimmer whereas MAC is more matte. In my opinion, because one has a slight shimmer and the other doesn't makes the one without appear darker but I prefer the shimmer because it adds depth. Hope that helps. Thanks, Anonymous, for the comparison - that was really helpful. As warmer shades are more flattering on my skintone and groundwork leans a bit cool on me, I guess I'll pass on this EL shadow, but check out the other colours!